Each year on December 10th, the world celebrates Human Rights Day in honor of the adoption of the Universal Declaration of Human Rights in 1948. This opening describes the concept of human rights at its core. They are rights that are not granted by any government or corporation, nor can they be taken away by a government or a corporation. Human rights are inherent to all simply on the basis of being human. The Declaration set the stage for many future human rights documents and treaties, including the International Covenant on Civil and Political Rights, the International Covenant on Economic, Social and Cultural Rights, the UN Convention Against Torture, and countless other national and regional human rights agreements and laws. While not technically binding, the Declaration has made possible numerous articles that are. Some of the many human rights protected in the Declaration include the right to life, due process rights, the right to freedom of expression, the right to an education, the protection from torture, and the right to an adequate standard of living. Individuals and groups around the world plans activities for Human Rights Day, ranging from the letter-writing campaign of Amnesty International to film screenings and lectures. While The 88 Project is thrilled by the progress made in human rights since the birth of the Declaration 66 years ago, we also recognize that much work must still be done both to ensure basic human rights for people worldwide that still do not have them and to maintain human rights where they already have taken hold. When we hear about the tales of success for some, it becomes easy to ignore the dire situations of others. While most people enjoy a decent standard of living in the US, people across the world, and in our own neighborhoods, still suffer from poor work conditions, discrimination, and a lack of access to healthcare and education, amongst other things. Many people, in all countries of the world, still live without their basic human rights or live in fear of losing them. Some are arbitrarily arrested. Some are deprived of their right to a nationality. Some are sold into slavery. And while many are fighting to help foster or stabilize human rights in their communities, there is always more that can be done. In honor of Human Rights Day, we would like to announce our intention to focus our work on prisoners of conscience in Vietnam on those whose stories are little known and who are rarely adopted by international organizations. We will also be focusing still on Tran Huynh Duy Thuc’s case and on the cases of female prisoners. Here at The 88 Project, we are focusing on one main human right: freedom of expression. However, while freedom of expression is our focus, it is important to note that through the promotion of freedom of expression, many other human rights are promoted as well, such as freedom of assembly, access to participate in public affairs, and due process rights, to name a few. 1) Stay engaged with the news, both in your country and internationally. 2) Speak up when you hear about something that doesn’t seem right, whether that is posting a reply to a news article online or speaking out about a problem at your school or workplace. 3) Use your personal connections to raise awareness for causes that you care about. Talk about your passions with the people around you. 4) Use your talents– whether its filmmaking, crafting, cooking, event planning, photography, comedy, music, or sports– to make a difference. Start a blog. Take a trip. Fundraise. Host a party. Join forces with a local organization. Start your own. 5) Engage with policymakers– through letters, phone calls, or social media– to show your support or disapproval for various laws or agreements that involve human rights. 6) Be aware of the purchases you make and how they effect others. 7) Give up something, big or small, to benefit someone else. 8) Get involved with us here at The 88 Project or with another human rights organization– donate your time, money, or talents and knowledge. 9) Read the Universal Declaration of Human Rights and share it with a friend. 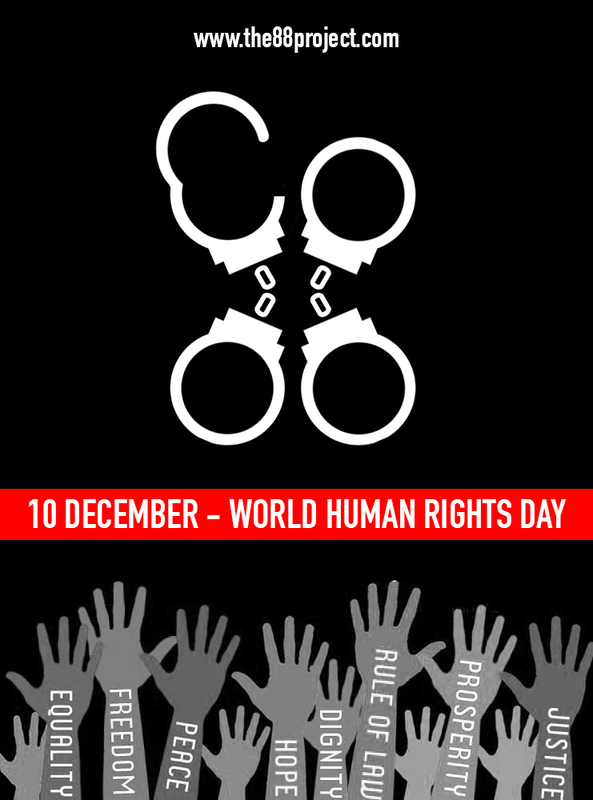 10) Remember that human rights are still, and will always be, relevant. Pick a right or two that resonate with you and think about how they apply to today’s world. Great, happy HR day to you. Thank you for sharing! I will share your work with our followers, and I look forward to speaking with you more in the future.